Online players of the top casino games now have the option to play on their mobile devices. But some mobile apps are better than others. 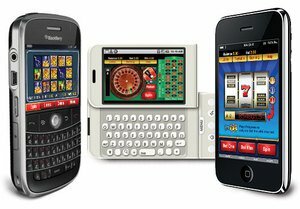 The following is a list of the top three real money gambling apps for Android and iOS mobile devices. These quality apps include poker, slots, and blackjack games. They also come from reputable online gaming venues. This means the compatibility and security will not be an issue when playing on the apps. 1. PokerStars Mobile App: this app is hosted by one of the gaming industry's leading casino operators. The app is for both Andriod and iOS with many unique features. It allows users to play up to five tables at once, includes access to the same tables as the desktop version of the casino, and offers a range of cash games and tournaments. Users will never be short of opponents or games. The only downfall of this app is the limited deposit options. Real money deposits must be made through the desktop site. 2. Jackpot City: this mobile app is of a very high quality with a great selection of games. The app is powered by the prominent software developer Microgaming. Users can play 17 different casino games such as bingo, video poker, table games and slots. The app is regularly updated with new games for your playing pleasure. All of Microgaming's games have the best graphics, themes, and visuals. The interface of the app is easy to use and there are multiple banking options. 3. Party Casino: the mobile app from this online casino operator offers a great selection of games such as progressive slots, blackjack, roulette, video poker, and popular table games. The app can even be used by players with Blackberry devices. It is versatile with top notch graphics. Users also have access to the in-house team at Party Gaming and the full range of banking options. Banking is secure and users do not need the desktop site to complete the transactions.